Printopia - All about apps in YOUR classroom! Price: $19.99 Evaluation copy available Like many teachers, I’m cheap when it comes to spending money for programs and apps. My choice for app of the week though expensive is well worth the $19.99 price tag. If you have used iOS devices a lot in a classroom settings you know the biggest issue is, "How do I get the student's work off of the device and into my hands for evaluation?". We have tried attaching printers to each of our iPad carts. The problem is that to get a printer that will handle a classroom full of devices you are talking about a commitment of hundreds of dollars. In addition I’m not sure that having students print is a good option anyways. How many times have we seen a printer spew out an 10 page Wikipedia page? A more practical approach would be get work into my hands let me grade it and then print off a few good examples for the class to see or share. It is here where I think Printopia excels. Not only does it make use of Apple’s AirPrint technology to print easily, but it also lets students print to any folder that I designate on my Macbook. This allows me to quickly gather all of the student work and then grade it at my leisure. This save to folder works incredibly quickly just the kind of response that you need during those crunch times at the end of a period when everyone is trying to finish up. 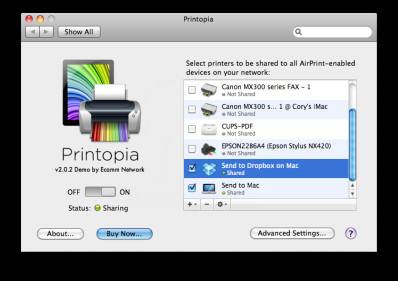 This also allow you to print /save directly to Dropbox, another time saving feature. I see installing Printopia to a central computer, say for example in the library or in a central hallway and then at the end of the day the teacher simply goes the that computer and transfers the days work onto a flash drive. Quick, easy, and efficient and a better solution than a $500 printer that will not work half of the time anyways.